Segments is an enterprise feature that is currently in beta. With this feature, you can divide your subscriber base into groups based on their behavior, device type or anonymity. You can craft notifications specific to the particular group of subscribers that you want to market to. 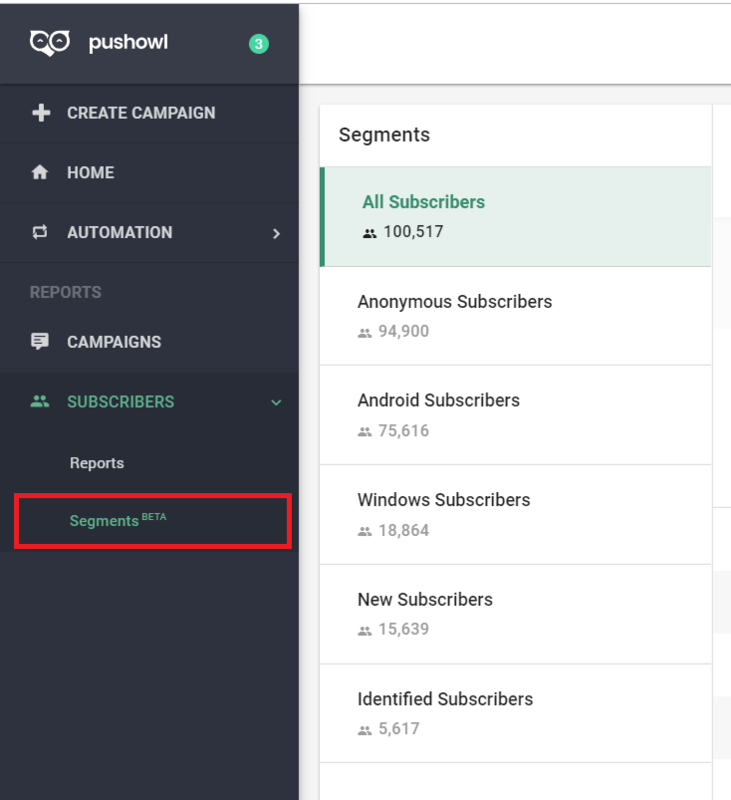 Currently, a PushOwl user has 6 segments available to them. Subscribers whose personal details are unknown. These are people who haven’t purchased from your store. Subscribers whose personal details are known. These include people who have bought from you. 2. Select the ‘Sending to’ dropdown. 3. Click on the segment you want to send your campaign to. 4. Fill in the rest of the fields. Another way to send campaigns to a particular segment is from the Segment page. You cannot see this page unless you are on the Enterprise plan. 1. Select ‘Subscribers’ and click on ‘Segments’. 2. Select the Segment you want to target. 3. Click on ‘’Send Campaign’ on the top right of the page. 4. You will be directed to the ‘Create Campaign’ page and you can craft your campaign specific to that segment. I want to send notifications to a new segment (like customers from the US). How can I do this? Our team will set up a new segment for you. You can also click on the ‘Request Segment’ button on the ‘Segment’ page to contact our team.